Today we will learn about hydraulic turbine and its types, working, advantages and disadvantages and. Hydraulic turbine which are generally known as water turbine used to convert hydraulic energy or we can say that energy of water (kinetic and pressure energy of water) into mechanical energy. This mechanical energy is further used to drive a generator which converts it into electrical energy. The basic concept of this type of turbine is that water flowing from a dam generates a pressure force while passing through the turbine. This pressure force use to rotate the turbine which further rotate the generator and convert hydraulic energy into electrical energy. According to Newton’s law a force is directly proportional to the change in momentum. So if there is any change in momentum of fluid a force is generated. In the hydraulic turbine blades or bucket (in case of Pelton wheel) are provided against the flow of water which change the momentum of it. As the momentum is change a resulting pressure force generated which rotate the rotor or turbine. The most important phenomenon is the amount of change in momentum of water which is directly proportional to force. As the change in momentum high the force generated is high which increase the energy conversion. 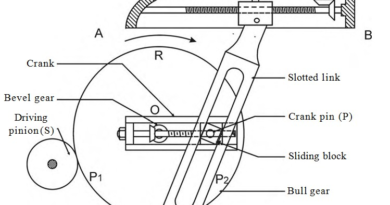 So the blade or buckets are designed so it can change maximum momentum of water. This is the basic principle of turbine. These turbines are used as hydro electric power plant. The hydraulic turbine can be classified according to the energy available at inlet, direction of flow of water, Specific speed, head available at inlet etc. These all types are described as below. Impulse turbine is those turbines which are use impulse energy or we can say kinetic energy of water to rotate the turbine. In this type of hydraulic turbine all pressure head or pressure energy is converted into velocity head or kinetic energy at the inlet of turbine by using nozzle. This high speed water jet strikes the blade or bucket of turbine which develop a force which rotate it. Only kinetic energy changes at the inlet and outlet of turbine and the pressure of water remain same. 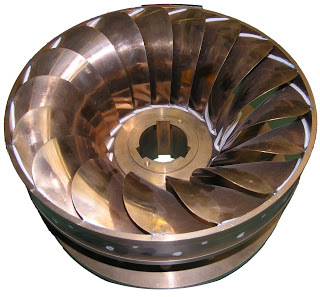 This kind of turbine is known as impulse turbine. There are various design available of impulse turbine but the Pelton wheel most suited for it. These are generally high head and low discharge hydraulic turbine. As the name implies these turbines is used pressure energy of water to rotate the turbine. In practically no turbine can purely used pressure energy. So it used both its pressure energy and kinetic energy. These turbines rotate partially due to impulse action and partially due to pressure change over the runner blades. 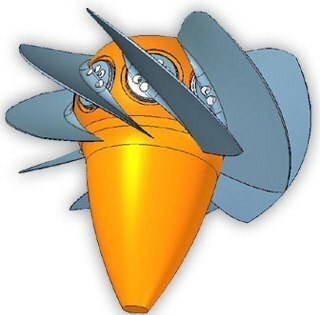 The water flow over blades covert both its kinetic energy as well as pressure energy into force and rotate the turbine. The change in pressure energy of water known as degree of reaction of the turbine. So it is known as reaction turbine. They are generally low head, high discharge turbine. In this type of turbine the water flows in radial direction. This is subdivided into two types. The first one is known as inward radial flow in which the water flows from periphery to the center. Example Francis turbine. Second one is known as outward flow radial turbine in which water flow towards periphery from center. When the water enters the turbine radically and exit axially or vice versa, it is known as mixed flow turbine. If the water level or water reservoir is above 150 – 2000 m from the axis of turbine, it is known as high head turbine. It is best suited for impulse turbine. If the water level is below 30 meter from the axis of turbine, it is known as low head turbine. These hydraulic turbine required high discharge rate to work efficiently. 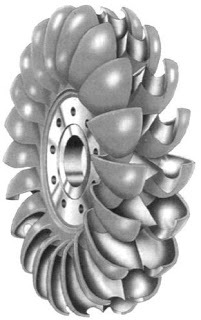 Example Kaplan turbine. Hydro power plant or we can say that hydraulic turbines are widely used form the last decades. It is an efficient renewable energy source. There are many up and downs in every project so there are also have many advantages and disadvantages which are describe below. It is a renewable energy source. Water energy can be used again and again. The running cost of turbine is less compare to other. It can be control fully. The gate of dam is closed when we does not need electricity and can be open when we needed. Dams are used from very long time so it can be used for power generation. It does not pollute environment. The dam constructed for hydraulic turbine can become a tourist place. Initial cost is very high. It takes several decades to become profitable. It can destroy the natural environment at site. Large dam cause big geological damages. It can develop at only few sites where proper amount of water is available. This is all about Hydraulic turbine working, types and advantages and disadvantages. If you have any query regarding this article, ask by commenting. If you like this article, don’t forget to share it on social networks. Thanks for reading it.